Maybe John’s guards don’t see Little John drilling the hole because they are rhinos, with their notoriously bad eyesight? Great analysis. Happily, I should say, Renard the Fox lives on in modern pop culture in the webcomic Gunnerkrigg Court, along with a version of Ysengrin. You’re leaving out one of the most influential and widely read sources of the archery contest, Walter Scott’s Ivanhoe (1820), which was one of the most popular novels of the nineteenth century in the UK and the US and still widely read into the twentieth> Ivanhoe’s archery contest is the first to show the feat (now obligatory in retellings of the the contest) of Robin besting his opponent by splitting his arrow. I don’t intend the post as a thorough investigation into all the sources for the film. That would be a far longer post. 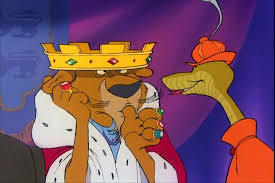 The corpus of Robin Hood stories is enormous, especially if you include all the various 20th century iterations on tv and film. I should have said I was responding specifically to the question (in your seventh paragraph) about sources of the archery tournament, and just thought I’d remind you of one of the most famous. But I realize now that you’re concentrating on the source golden arrow prize, which isn’t in Scott. Anyway, thanks for your great post. My wife, a medievalist who works on Beguines, had been thinking about working on Reynard, since there’s apparently some version of the stories in which a Beguine gets eaten. Now that sounds like a story I’d like to see as a movie! By the way, no lesser a figure than Goethe wrote a Reynard poem, under his German name of “Reineke Fuchs.” The lion in the German version is “Nobel.” I think it’s interesting that Reineke’s sole friend is, in fact, a badger, Grimbart, Reineke’s nephew (! ); Braun the bear, unfortunately, is one of his antagonists. It’s nice that you bought up the version of Reynard published in 1945 by Harry J. Owens with Keith Ward’s illustrations. 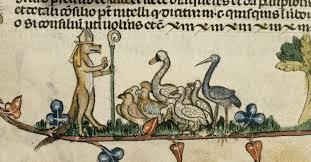 I would say Mr. Ward had attempted a kind of middle ground when it came to anthropomorphising animals while retaining certain elements that still made them an animal, namely their body structure. Up to that point, at least in cartoons, the idea seemed to be mostly to go very humanistic in the physique without too much attention given to how would joints work or plausibility of a digitigrade mammal to actually stand on two legs in a plantigrade fashion. Such questions we never raised a whole lot, and artists of old often favored retaining that odd digitigrade look in illustrations for centuries, never quite on the level that Keith predicted would become a favorable approach in his take on a classic folktale. I do have a copy of this book in my collection and for what was written here, I did think an animated take on the tale wouldn’t have been that hard to do given how often the Disney studio was known to soften a lot of these things up in their adaptations (Pinocchio was quite a different take from Collodi’s original vision). We’re already seeing many of these folk tales get watered down further as the years roll on. 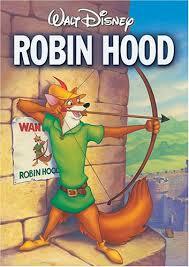 But Robin Hood is a problematic story for children since, like Reynard, he is anti-authoritarian. However, by merging the two figures and making an animated fox the hero fighting against a cowardly lion who is not the legitimate ruler, Anderson was able to kill two birds with one stone by taming the violence and reducing the anti-authoritarianism of both stories. Of course it didn’t stop the Disney studio from having approached Robin Hood some 20 years earlier in a live-action version, I’m sure that was pretty kid friendly anyway if it stayed roughly in the same ground Treasure island did a few years earlier. I’m sure unlike Reynard, there had probably been watered down adaptations of the Robin Hood tale for quite a while by the time the 20th century had found a place for him on the big screen like in Errol Flynn’s portrayal of the guy in 1939. And while Disney may have lost out on wanting to adapt Reynard to an animated feature, it hadn’t stopped the fox’s chance of being adapted to other such projects in the ensuing years.